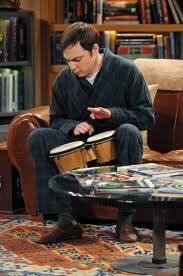 Sheldon likes to play bongos. . Wallpaper and background images in the 빅뱅이론 club tagged: the big bang theory cbs. This 빅뱅이론 photo contains 독서실, 아테나 신전, 아테나 신, 아테네 움, 아, 서점, 헌책방, 서 점, and 헌 책 방.